The Speedplay fore/aft adapter kit is an important piece in non-regular fit solutions for orthopedically challenged bike fit solutions. The extender base plate can replace speedplay’s standard base plate. The extender base plate is reported to create 2mm additional forward positioning and 14mm additional rearward positioning than the standard base plate. 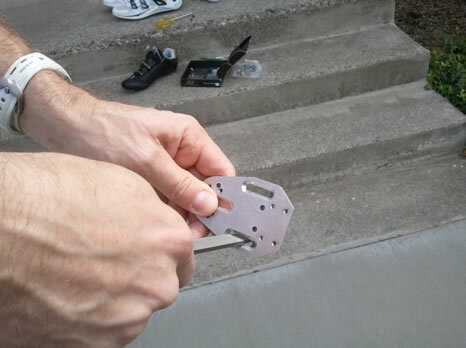 The ability of the increase aft cleat placement availability eliminates the need for a bicyclist to “re-drill” their shoes in the event they need a more aft-ward placement of a cleat. This solution works for Speedplay’s Light Action, X-series, and Zero pedals. The extender base plate is well-made, from CNC-machined aluminum. I have found this plate often times is a little snug or narrow and can strip or wear down the initial threads of a screw when attaching the base plate. The simple solution is to use a small, flat metal file (Figure 1) and lightly file the edges of the slot (Figure 2). Taking off no more than 1mm (suggested just a little less than 1mm/side) per side will maintain a secure and clean attachment of base plate to shoe. You are essentially cleaning up the machined edges of the screw slots. Removal of inappropriate amounts of material from the base plate can result in failure of the equipment. Use caution and good judgment. If you are unsure, have a qualified professional help you with this basic adjustment.